For this month's "Maps Of The Month" featurette, I wish to draw your attention to KeyBlade999's Pokémon: Yellow Version (GB) maps. When Pokémon came out on the original Game Boy, Pikachu was not initially considered a "main" Pokémon. You would start the game with Bulbasaur, Charmander or Squirtle, and their fully evolved forms would be featured on the boxes/labels for Pokémon: Green Version (Japan only), Red Version, and Blue Version, respectively. Pikachu is numbered #025 in the Pokédex, and though catchable relatively early, is an uncommon Pokémon to encounter, and gameplay or story-wise, wasn't anything special in particular. But then the merchandising opportunities favoured the "cute" Pokémon such as Pikachu and Clefairy, and it was the animated series that firmly established Pikachu as the series's mascot. So, not surprisingly, soon came an enhanced version of the original generation of games that was called Pokémon: Yellow Version ("Special Pikachu Edition" on the box), a fitting colour as it is of course the colour of Pikachu and goes well with the other first generation games, which include Red, Green (in Japan) and Blue. Just like in the anime, Pikachu is the only available starter Pokémon and follows the main character around (as opposed to staying in its Poké Ball). Also from the anime, the Team Rocket duo of Jessie and James make appearances here. And as with the different versions of Pokémon, the frequency and availability of Pokémon species is different. Some graphics are tweaked, and enhanced when playing on the Game Boy Color (except for the Japanese version), so despite an overall structural similarity to the original games, KeyBlade999 felt it was worth mapping. This is also the first of the enhanced remakes that the next few generations of Pokémon would have, including Crystal (to Gold and Silver), Emerald (to Ruby and Sapphire) and Platinum (to Diamond and Pearl). And it will be remade yet again, with Pokémon: Let's Go Pikachu (and Pokémon: Let's Go Eevee) available for the Nintendo Switch in November 2018. Though Pikachu is now everywhere with anything that has to do with Pokémon, and a mascot for Nintendo as a whole and even a Japanese pop culture icon, it was this 1999 Game Boy game where Pikachu really started being front and center. 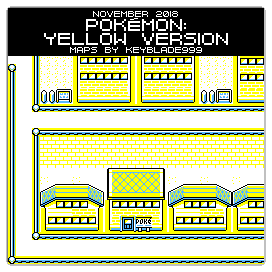 So to recognize the effort put into mapping the first (of very many) games to prominently feature Pikachu, KeyBlade999's Pokémon: Yellow Version (GB) maps will be known as VGMaps.com's Maps Of The Month for November 2018.